Salt glow: It’s more than just feeling great! May 11, 2016 by Heidi·Comments Off on Salt glow: It’s more than just feeling great! What is a salt glow treatment? 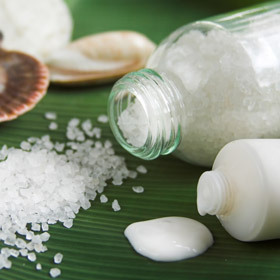 At Renu, Mediterranean sea salts are blended with jojoba oil and your essential oil of choice. It’s specially mixed just for you and your appointment; there are no additives or anything artificial. This mixture is applied by hand to your arms, legs and back, with special care on any rough areas to thoroughly cleanse the skin of its dead cells. The therapist will rub the salt mixture on your skin to break up the top surface and remove the outer layer of skin that is ready to go. The salt scrub is removed with warm wet towels, leaving your skin feeling soft and refreshed after shedding its dead layer. 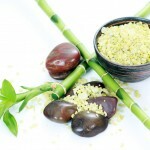 Sea salts have many health benefits and work well with the skin in ways that table salts cannot. Exfoliation with sea salts helps to remove dead skin particles, tones up the skin tissues, encourages peripheral blood circulation, and helps in skin renewal. Sea salts have an anti-inflammatory effect and also aids in detoxification, while at the same time improving blood circulation during the salt glow treatment. Sea salt works especially well at revealing your soft and smooth skin. Just like getting a facial periodically is so good for your skin, doing a full body salt glow treatment is wonderfully healthy for your skin and your body – you’d be amazed how much dead skin accumulates over winter! Plus it feels so good and leaves you with beautifully soft and rejuvenated skin. Combine it with a massage in any of our salt glow packages, and you will feel like a new you. This is healthful indulgence – you feel like you are splurging, but you are in fact taking care of both your outside as well as your inside self.